Established in 1991, the Duo Sutre-Kim was founded in Paris by violinist Guillaume Sutre, founding member of Trio Wanderer and subsequently first violin of Quatuor Ysaÿe, and harpist Kyunghee Kim-Sutre, graduate of the Curtis Institute of Music and Conservatoire supérieur de musique de la Ville de Paris. After a Premier Prix au Concours de Musique de Chambre Lily Laskine, the duo toured Europe, the United States, and Asia, exploring and deepening the repertoire for violin and harp. 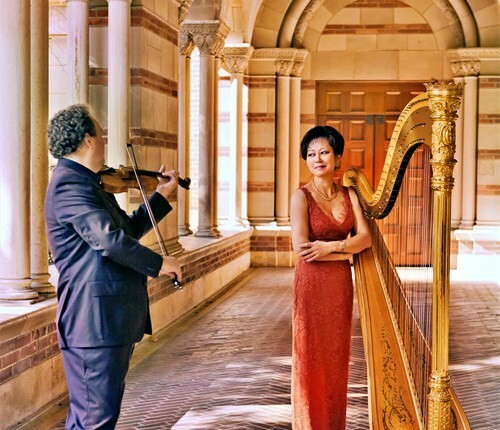 The concerts of Duo Sutre-Kim are always much appreciated, reviving—with the musicians’ intimate style and profound understanding—works whose charm recalls the creative and joyful sensibility of the la belle époque. Inspired by their native cultures and their numerous travels throughout the world, Kyunghee Kim-Sutre and Guillaume Sutre love to assemble original thematic programs, often accompanied by musicians such as Movses Pogossian, Richard O’Neill, Ronald Leonard, Sung-Won Yang, Quatuor Ysaÿe, and Romain Guyot.